Tetley, the British tea brand, has launched a new television commercial featuring Sydney, one of the Tetley Tea Folk, singing Billy Joel’s 1970s song “Just the Way You Are”. The ad is the fourth in the Tea Folk come-back series launched in September 2010. But in true Sydney style he cannot quite hit all the notes and forgets some the words. The Tetley Tea Folk have their own website, Youtube channel, Twitter and Facebook accounts. The Tetley Tea Folk will be back with an ad for Tetley Extra Strong on 22nd October and Tetley Green Tea in January 2012. 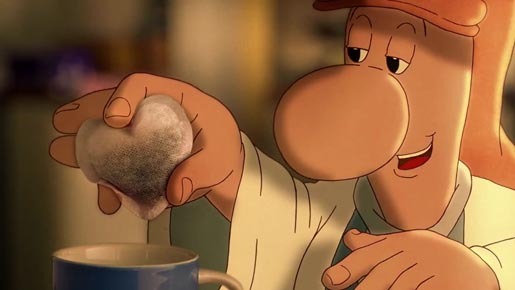 The Tetley Tea Folk campaign was developed at Dare, London by creative director Danny Brooke Taylor, creatives Richard Stoney and Dave Hobbs, and producer Rebecca O’Sullivan. Filming was shot by director Jeff Stark via Another Film Company with producer Vanessa Hetherington. Editor was Scot Crane at The Quarry with assistant editor Steve Dunne. Post-production / VFX was produced at The Mill, London, by VFX producer Tracey Khan, shoot supervisor Pete Rypstra, 2D lead artists Pete Rypstra, 2D artist Adam Lambert, colourist Seamus O’Kane, animator Richard Ollive, Toon Boom artists Robert Granger, Emily Greeley and Luke Tribe. Richard Ollive worked on the Tea Folk ads in the 80s and 90s, taking over from their first animator, Tony Cattaneo.